The Cisco IP Phone 7965 is a leap forward in technology for telephone users. Wideband audio in high-fidelity and better navigation work together to provide users with a better experience compared to previous models of Cisco IP phones. High-fidelity audio allows telephone conversations to sound so real that users might think they are talking to someone standing right by them. A larger backlit display allows users to use third-party phone applications, as well as Cisco’s trademark Unified Communications. For lossy networks, the Cisco IP Phone 7965 provides iLBC (Internet Low Bitrate Codec) support. A more user-friendly navigation cluster makes selecting a function a snap, while GigE (Gigabit Ethernet) connectivity allows transmission of Ethernet frames at a speed of one gigabit per second. The phone features six line and feature keys that are easily programmed, and guides users through call functions and features with four dynamic soft keys. With a built-in port for a user’s headset and a speakerphone that won’t make users seem to be calling from a remote island, the Cisco IP Phone 7965 make even work calls turn into pleasant tasks. A message key provides users direct access to their voicemails. Users can view more information at one time, providing even more convenience. The phone features a two-port internal Cisco Ethernet switch, and is powered by a 48-volt DC power supply, which is sold separately. It also can be powered by 802.3af PoE (Power over Ethernet). Cisco offers buyers the opportunity to get a spare or a replacement phone without purchasing an additional license. 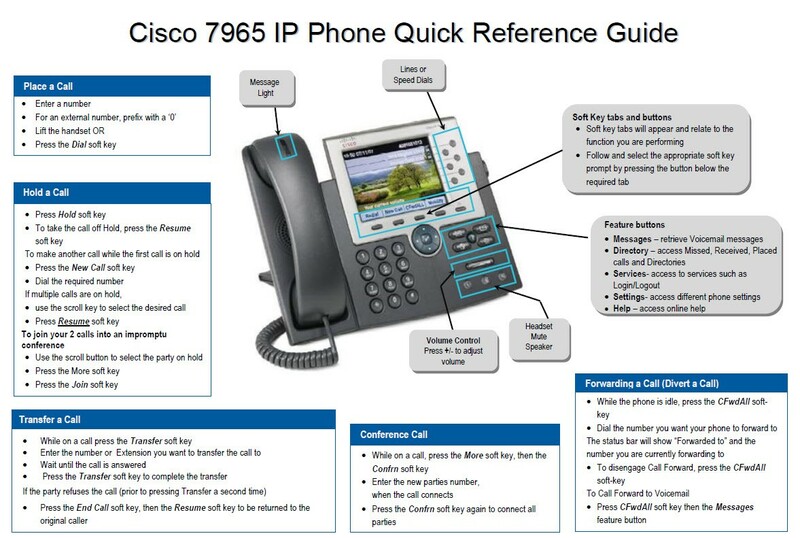 For current Cisco users, the Cisco IP Phone 7965 comes pre-loaded with SCCP. Some reviewers, however, claim that users who want to perform a TFTP upgrade to a higher level of firmware is a difficult process, requiring a high level of technical expertise. A two-year VoiPLINK warranty covers the phone in case of manufacturer’s defects. Remanufactured defects are also covered by the warranty. Cisco has not announced any dates for the product’s end of sale and end of support, so buyers can rest assured that the phone will not become obsolete during the near future, a very real concern for businesses who want a long period of service out of their phone.